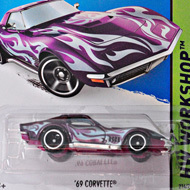 218/250 is part of the HW Workshop series and the 2014 Super Treasure Hunt set. It has dark orange Spectraflame paint embellished with yellow flames outlined in purple. The trunk has “TH” and the sides have the Hot Wheels logo. 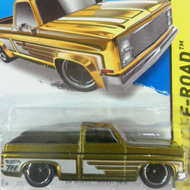 It has clear windows, a tan interior, Real Rider Steelie wheels with gold chrome rims, and a gold chrome plastic Malaysia base. The car made its debut in the 1998 First Editions series and is based upon the actual vehicle. 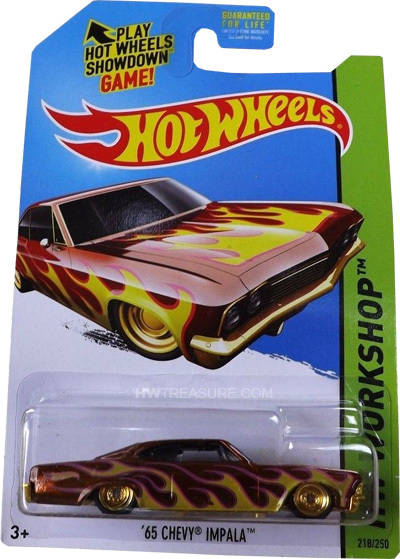 This is the third Impala used as a T-Hunt. The ’59 appeared in 1999 and the ’58 was in the 2011 set.